Galina Chistiakova was born in 1987 in Moscow into a musical family. 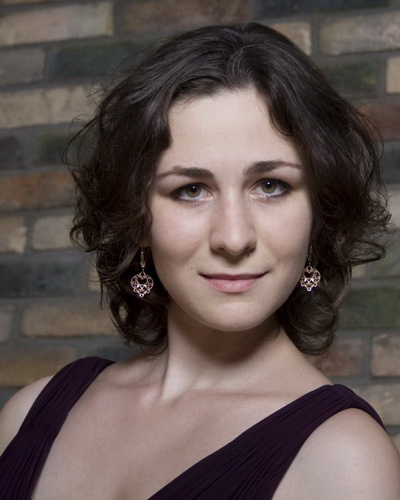 She started her piano studies at 3 years old with her mother and professor Helena Khoven. In 1993 she successfully entered The Central Music School under the Moscow Conservatory named after P. Tchaikovsky. She studied with Professor Helena Khoven and Professor Anatoly Ryabov, with whom she finished The Central Music School in 2005. During her school years Galina won many prizes in different competitions, including the international: “The 3rd Moscow International Chopin Competition for Young Pianists” (2000); “The 7th European Chopin Competition in Darmstadt” (2002); “The 2nd International Piano Competition in Memory of Emil Gilels”, (Odessa, 2003). “The 3rd Scriabin International Piano Competition” (Moscow 2004). In 2005 Galina entered The Moscow Conservatory and finished it in 2010 with Professor, People’s Artist of Russia Mikhail Voskresensky. Since then she has also become a prizewinner of many international competitions, among them: “Maria Callas Grand Prix 2008” (Athens, Greece); “10th Concourse Grieg – I.P.C.” (Oslo, Norway, 2009), Andorra IPC (2010) and many others. Galina has also been awarded scholarships in many foundations: “Russian Performing Art”, “V. Spivakov's foundation”, “New Names” and “A. Scriabin Association”. She has also recorded compact discs with them. She played in master class of A. Sandler, A. Bonduryansky, D. Bashkirov, P.Badura-Skoda, T. Currentzis etc. In November 2011 Galina has won the 1st prize on "The 2nd International Piano Concerto Competition" in Shenzhen, China. Galina has large and various repertoire, which includes works of different style composers, from the baroque to romantic and modern periods. Except for solo, she also plays an active part in chamber music with different ensembles. The most frequent and permanent of them is a piano duet with her younger sister Irina Chistiakova. Since 2000 Galina traveled, playing solo and with symphonic orchestras, in concerts over Russia, France, Germany, Poland, Austria, Italy, Czech, Belarus, Ukraine, Finland, Japan, Greece, Andorra, Spain, Monaco, Norway. She has also performed on various TV and Radio programs. She played solo concert at the International festival “Biennale” in Greece. Galina has also been worked several times as a member of the jury at youth competitions in Russia. She is a member of A.Scriabin society in Moscow.